From where have we inherited the assumption that meaning is found beneath the surface? That depth equates to value, and superficiality is a sin? According to the Online Etymology Dictionary the word ‘superficial’ dates from the late 14th century and was, initially at least, purely an anatomical and mathematical word that meant ‘of or related to a surface’. It was only in the early part of the next century that its more common meaning – “not deep, without thorough understanding, cursory, comprehending only what is apparent or obvious” – emerges. This timing is, I think, important. It is at exactly this time, towards the end of the 13th century and during the beginning of the 14th, that the concept of depth is coming to prominence in Western art through the invention of linear perspective. Linear perspective is a geometrical formulation that allows us to perceive depth within a two-dimensional image. We are probably all familiar with its converging lines and what they represent – an imagined world receding into the distance. This space defined by linear perspective is calculable, navigable, and predictable. It allows the calculation of future risk, which can be anticipated, and therefore, managed. As a consequence, linear perspective not only transforms space, but also introduces the notion of a linear time, which allows mathematical prediction and, with it, linear progress. This is the second, temporal meaning of perspective: a view onto a calculable future. As Walter Benjamin argued, time can become just as homogenous and empty as space. And for all these calculations to operate, we must necessarily assume an observer standing on a stable ground looking out towards a vanishing point on a flat, and actually quite artificial, horizon. 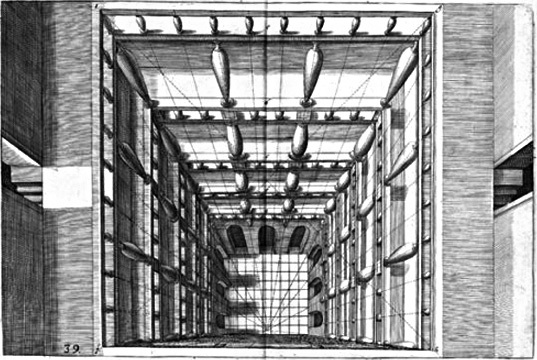 Linear perspective constructs a representation of the world governed by a set of mathematical rules. Consequently that world becomes legible and navigable for those people with the knowledge and power to interpret and manipulate those rules. People with depth, who thus become the gatekeepers of meaning and morality. But as Steyerl points out, this morality is a false and corrupting morality – one founded on a myth of objectivity reliant on a horizon that is straighter than it has any right to be. An example of the kind of effect caused by this association of depth with value and meaning can be seen in the transformation of Christian iconography in roughly this period, as described in Lebanese artist Tony Chakar’s beautiful talk Any World That I’m Welcome to (Is Better Than the World I Come From). Early painted icons were a surface ballet, meaning derived from an interplay of signs happening here in the room with us – a function of the icon and our relationship to it. With the introduction of depth this meaning retreats from the surface and becomes locked away in the intangible, impossible beings those paintings depict. Magic and spirituality is no longer something residing in the icon itself, something belonging to us, but instead becomes something distant that the icon only serves to represent . Consequently perhaps an answer to my initial question is that depth equates to meaning only as a result of system developed in the West over the last 600 years or so that concentrates power amongst a cognoscenti and strips the ordinary, everyday world of some of the value it once had. Louise Mari and Nigel Barrett’s The Body is an incredibly, compellingly superficial show. In fact I can’t remember a time I have seen a show that so gloriously disregarded any assumptions I might have about the importance of depth to good theatre. It is a show in which meaning seems to wholly reside in it’s rich and remarkable surfaces. Fragmentary moments flicker like symbols rather than scenes – a mechanical doll swimming endlessly in a tank of water; a microscopic camera reducing Nigel to a collage of colours projected on to the wall behind him; another doll sitting on a mound of sand whilst old home videos of a seaside holiday flicker in the background; the back wall pulled away to reveal a breathtakingly vast cavern of dolls, a violinist lost somewhere in the midst of them. As scene after scene spills through the revolving doors at the sides of the miniaturised auditorium at a rate of about one every minute and a half, it felt like I was having to learn a new theatrical language. But what end might this radical superficiality be serving? 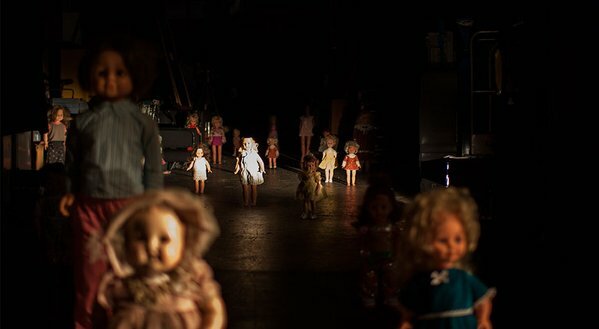 Perhaps the clue is in the dolls that litter every scene. They too are all surface, after all – a representation of reality (and humanity) that renders it entirely as material and mechanics. There is no depth. No soul. No spirit. At one point we see a doll walking across the stage towards us, its podgy, fleshy head and limbs giving way to a skeletal metal torso. We see piles of limbs, disembodied arms. We hold in our hands delicate, uncannily lifelike babies with battery powered heartbeats that are thrown unceremoniously into a giant cardboard box at the end of the show. And remarkably, rather than these dolls becoming animated through stage trickery – a far more disconcerting transformation takes place. We humans, audience and performers, are remade in their superficial image. Jess and Nigel speak the same mechanically vacant lines as the automated voices of their plastic co-performers. They are lost amidst this sea of facsimiles. And even our own human heartbeats – the literal and figurative essence our ‘depth’, our being-ness – are converted into surface information; a patina of drumbeats to accompany the images onstage. The body is a show about bodies and it is a re-embodiment, connecting us not only with our own fleshy superficiality but with the object world that we are so ineluctably a part of. In its delirious and deranged way it dredges meaning from depths and makes it a function again of light and sound and our own physical bodies in space. In doing so it feels not only excitingly new, but perhaps also connected to set of traditions that are very old indeed. An interesting side note. Tony talks describes how an icon is always ‘written’ rather than painted, and I wonder if the same is true of a play and if this linguistic confusion is the reason that undue prominence is historically given to the playwright who is, in the end, only ever one of the writers of the play.